Spontaneous pattern formation in cortical activity may have consequences for perception, but little is known about the interaction between sensory-driven and self-organized cortical activity. 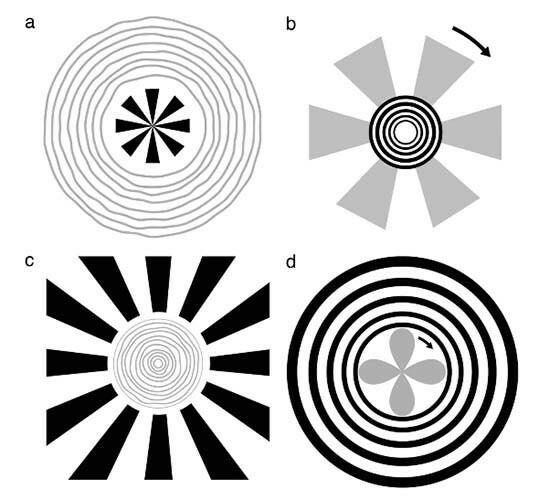 To address this deficit, we explored the relationship between ordinary stimulus-controlled pattern perception and the autonomous hallucinatory geometrical pattern formation that occurs for unstructured visual stimulation (e.g., empty-field flicker). We found that flicker-induced hallucinations are biased by the presence of adjacent geometrical stimuli; geometrical forms that map to cortical area V1 as orthogonal gratings are perceptually opponent inbiasing hallucinations. Rotating fan blades and pulsating circular patterns are the most salient biased hallucinations.